ONE of the most anticipated utes in recent times, the 2018 Mercedes-Benz X-Class has arrived, and we’ve slipped behind the wheel of its top of the tree variant for a test of the first dual cab pickup from the German giant. 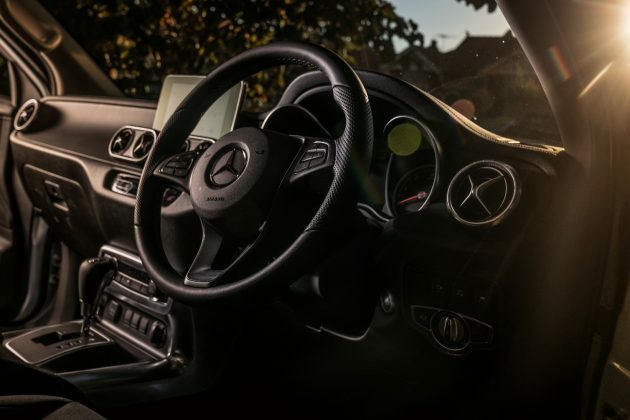 Mercedes Benz is a fascinating company because while it enjoys tremendous prestige as a luxury and performance car maker, it also makes the vans that deliver your eBay purchases along with big trucks that ply the highways and buses that carry passengers. Someone said to me a few years ago that Benz was taking a risk selling working vehicles because someone buying a $400,000 S Class or SLS sports car would be put off if old mate pulls up in a van or truck with the same three-pointed star on the front. Despite that observation it hasn’t ever really affected the company’s prestige, it can juggle the difference between working class and upper end prestige, and it seems everything in between, better than any other car maker out there. 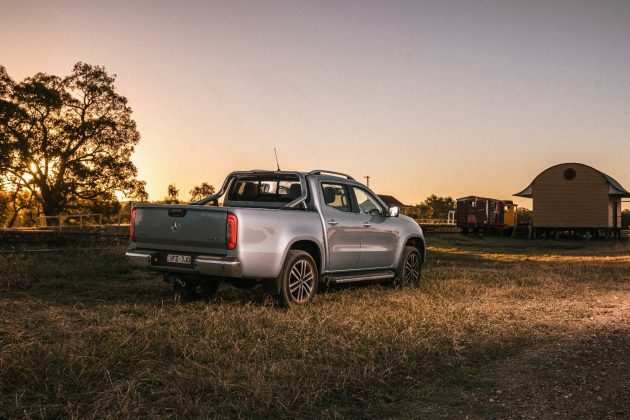 So it was of huge interest across the industry when Mercedes announced it would develop a pickup, and even more interesting when it was realised that the X-Class would share underpinnings with Nissan’s Navara and, in the future, Renault’s upcoming Alaskan ute. But when it’s parked next to a Navara you realise that it is quite different to the Nissan in looks, although the basic body shape is the same. Most of the panels have been redesigned and given a more Mercedes-Benz look. Similarly, the interior is very different from its Nissan cousin, with quite a dollop of Mercedes-Benz luxury touches, as you might expect, particularly since we were testing the top of the line X250d Power model. In fact the X-Class is wider from front to rear and has a much more substantial look than most other utes in the segment, and there is that three-pointed star on the grille. 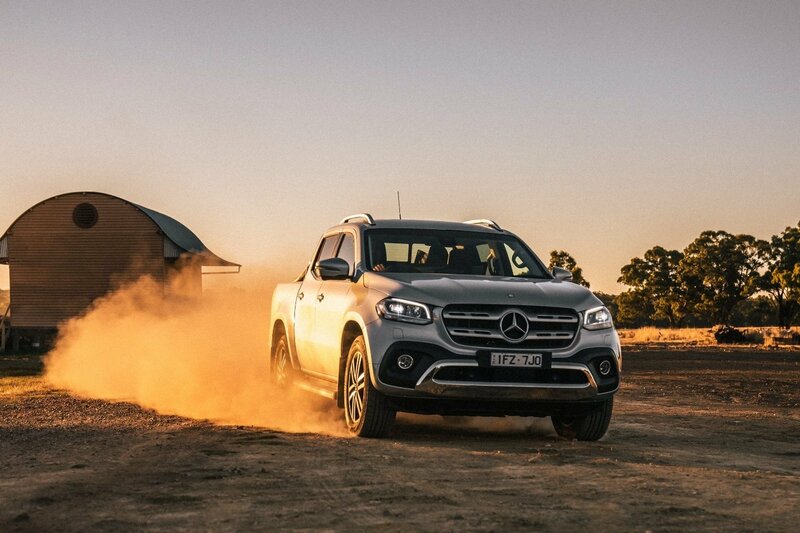 In our week behind the wheel of the X-Class, this was something that attracted the most attention, a Mercedes ute certainly dragged some looks and we reckon it is that coveted symbol that will make the X-class a popular choice in the upper end of the market. That three pointed star certainly adds the ‘class’ to X-Class. It has an air of luxury and presence that other utes in the class will have trouble matching. It has a wide track, a wider tray and a nice shape, all adding to that presence on the road. The Power model we tested is the only one available with a ute tub (there are lower entry level cab chassis versions on the Pure and Progressive models), and will set you back $61,600 for the manual, or $64,500 for the 7-speed auto (plus on-roads). The range kicks off at a much lower than that though, at a quite reasonable $45,450 for the entry level Pure cab-chassis, rear-wheel drive manual. The range then climbs through other variants and models up to the Power. The Power scores chrome-accented bumpers, 18-inch alloy wheels, LED headlights and tail-lights, power-folding and heated side mirrors, Artico faux leather trimmed dash panel with contrast stitching, and Artico and micro suede seat trim. It also gets an 8.4-inch ‘Command Online’ multimedia screen with an eight speaker sound system and DAB radio, Garmin satellite navigation, an auto-dimming rear view mirror, and integrated 360-degree camera system. If that’s not enough, it also gets power front seats with lumbar support, semi-automated park assist, dual-zone climate control, key less entry and start, and aluminium sill protectors. It may not be an S class but the X-Class is pretty well equipped for a ute and is also chock full of safety features, as you would expect in a Benz. Surprisingly, it doesn’t come with a tub liner as standard – instead it’s an $899 option. There’s no tonneau cover, again it’s an option, at $1040, while a hard lid is a massive $3020, and a roller cover $3295. It’s worth noting that Ford’s Ranger Wildtrak, one of the Merc’s biggest competitors, gets a roller cover as standard. As you would expect, it’s finished perfectly and while the Power we had was finished in basic blacks and greys, there’s a variety of interior colours and finishes to choose from, including one with brown leather seats, beige headliner and wood trimming. The comfort levels are good, with the front seat offering good room and support, with bottle holders in the doors, a covered console locker between the seats, and some small cup holders and limited loose item storage in front of the gear shift. Room in the back seat is not overly abundant and taller occupants will find it fairly cramped. The low roof line is also really annoying, making it difficult to enter and exit the X-Class. We also found the driver and passenger seats to be mounted quite high, which made it feel a little claustrophobic and tight, with the rear seat area no better. The X-Class cabin doesn’t feel as spacious or roomy as say its VW Amarok rival, for example. Out back in the tradesman’s playground, there is plenty of room, with the longest tray in its class at 1,581mm long. The width of 1,560mm is more than adequate too, and will fit a standard Aussie pallet between the wheels (width is 1,215mm). It’s also 475mm deep, meaning it provides a good, roomy and practical tub space, it’s just a pity that a tub liner is an optional extra. The X250d Power we tested boasted a 1,016kg payload, while the less optioned and lighter models range up to a 1067 kg payload. 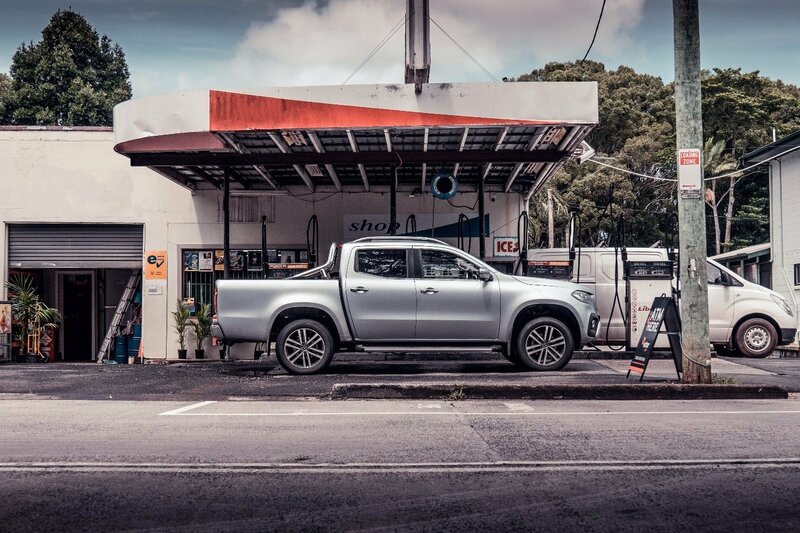 Initially, the X-Class is only available with a pair of Nissan-sourced turbo diesels. The X220d comes with a single turbo 2.3-litre power plant pushing out 120kW of power and 430Nm of torque. The X250d will ship with a twin-turbo 2.3-litre engine that shovels 140kW of power and 450Nm of torque. It comes with 4Matic four-wheel drive, with the choice of either a 6-speed manual or the 7-speed automatic we drove. We did a limited towing test with the X-Class, towing a rally car across town, and it did the job easily, grunting up some steep hills, with the 7-speed auto shifting well. It has a towing capacity of 3.5-tonnes for a braked trailer. Fuel economy was quite good too, and in a variety of conditions we recorded around 8.8-litres/100km, which was impressive in our view. Not surprisingly either, the X-Class has earned a 5-star ANCAP safety rating. It has seven airbags, auto emergency braking, a vibration based lane departure warning system, but is let down down by some not so great handling. On a nice smooth country road we hurried it through some twists and turns with a good deal of aplomb, but on choppy stuff it was quite nervous. It is certainly better than most of its Japanese rivals, especially its cousin the Navara though. 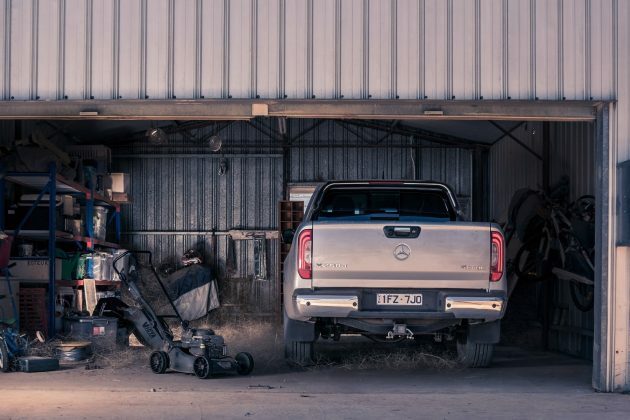 Part of this is down to the fact that the X-Class uses double wishbone front suspension and a five-link coil spring rear suspension, putting it well ahead of its opponents in most cases. Just about everyone we spoke to when testing the X-Class asked if it was like a Navara or better than that, such has been the interest in Mercedes-Benz first dual cab pickup, and its true origins. We have to say it is better than the Navara in every way, but it’s also a lot more expensive. While it’s no game changer, it does offer good performance, luxury, safety, towing and driving, and it does have a three pointed star. Fans of the new X-Class have a decision to make though, buy now, or wait for the mooted 3.0-litre V6 turbo diesel, to be branded the X350d, with 190kW of power and 550Nm of torque, permanent all-wheel drive, and a low-range transfer case. It’s due later this year and is likely to be significantly more expensive. And in case you’re interested, the X-Class is available in Danakil Red, Granite Green, Chisana White, Axinite Bronze, Cavansite Blue, Rock Grey, Kabara Black, Bering White and Diamond Silver. Our test vehicle was provided by Mercedes-Benz Vans Australia. 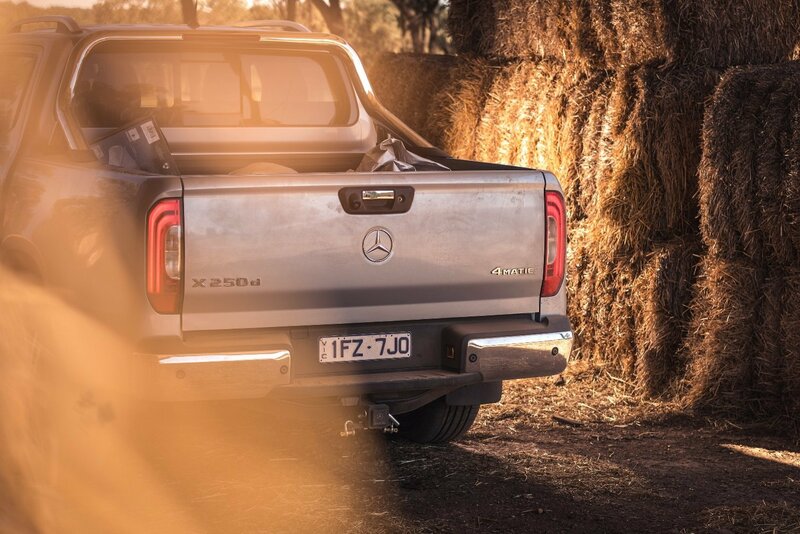 To find out more about the 2018 Mercedes-Benz X-Class X250d Power, contact your local Mercedes-Benz dealer. Jon Thomson has been writing about cars and motor sport since 1979, covering every Bathurst 1000 since 1980 and every Australian Grand Prix since 1982. He was the motoring editor of The Canberra Times and has driven cars on every continent apart from Antarctica. He is currently the publisher and editor-in-chief of Transport & Trucking Australia and Coach & Bus magazine. THE struggle is real. Choosing the right Mercedes-AMG GT model is now twice as hard and twice as exciting, with the Australian range to include the open-top Roadster models for the first time ever.